which is big enough to serve as a reacquainting area for three adult rams or as a lambing jug for a ewe and twins. She’s wondering if she’s going to grow to fit! She’s quite safe in her area from pushy ewes while she is still so small and being in the barn will keep her from forgetting that she is a sheep. Annie is the lamb of two Jacobs I sold two years ago. 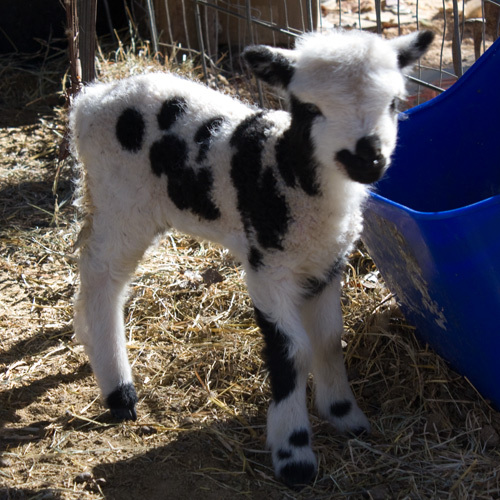 Her mother didn’t accept her, but did keep her twin brother and also raised a lamb last year as a yearling. 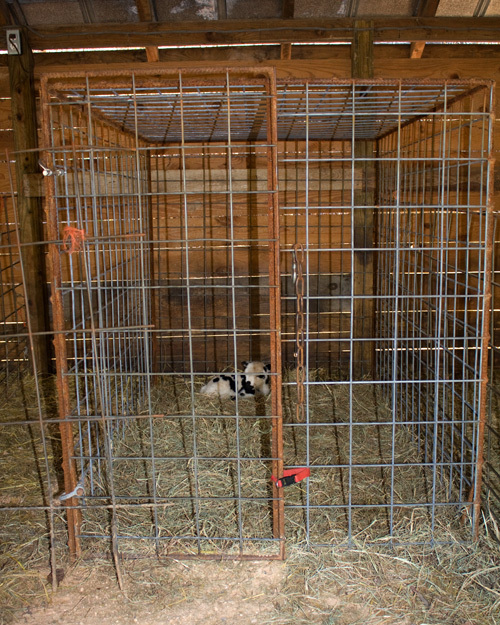 Work restraints at her owners’ home placed Annie in need of a place where someone would be around to take over the job of Jacob mother. So she’s here. She’s settled in nicely (and her tummy has also settled nicely, thank goodness.) and is active, bouncy, and hungry! Always a concern when a lamb is rejected is whether or not this is a trait that is going to carry through her generation. It’s possible and something to watch for, but knowing Annie’s background for many generations including the mothering abilities of her ancestors, I think she’ll do just fine as a mother if that is in her future. Her mother is quite likely to raise twins next year with no problem. Annie is my second bottle baby Jacob in 15 years. Badger rolled down the hill when she was born. Her dam, St. Jude’s Janice, found herself with her first set of twins – one of which was way down to h*** and yonder before she could get to her. 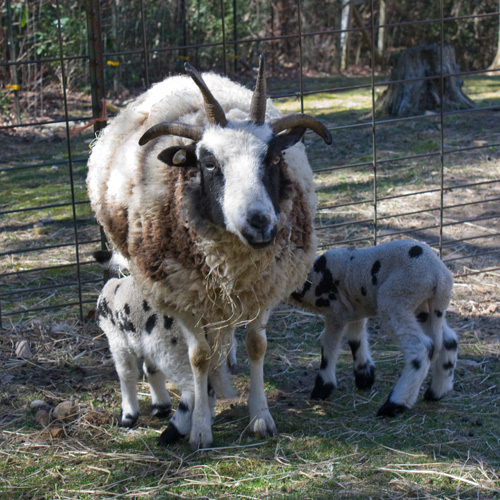 Lambing on gentler terrain, Janice has since raised at least two sets of twins that I know of. Bottle baby, Badger, is currently raising her second of twins.